Chalkbeat uses its average number of unique visitors per month to understand how much of its total addressable market it's reaching. Why study your audience? Simply put, without audiences there would be no media. In other words, a news outlet can’t exist without an audience. "It’s all about going to where readers are -- not assuming that they will come to you." Education participants: These include students and parents/guardians. Education professionals: People who work in schools. These include teachers, principals, assistant principals, instructional coaches and paraprofessionals. Influencers/policymakers: People who influence or try to influence what happens in and to schools. These include lawmakers, policymakers, school board members, school system administrators, advocacy and nonprofit organizations. General public: These are people who aren’t specifically focused on education but care about participating in local government and want to stay informed. Now that we have an understanding of who we want to reach, step two is finding out the “addressable market.” Or in other words, what is our total number of potential readers? If I was going about this the way Batsell and Griggs are, I’d find out how many members the NYC teachers union has and I’d get an exact count of how many employees work at the city and state’s education departments. I hope to be able to do that down the road, but for now, I gotta ballpark the numbers. *The total estimated reader base doesn’t include policymakers, influencers or voters. Students are used as a proxy for parents. Now, ideally, we’d know exactly which group every single one of our readers falls into when he or she visits our site so that we know if we aren’t reaching enough parents or if most of our readers are only education professionals. But we don’t currently have a registration system for our readers to sign into and identify which group they fall into. So for now, we’re using our average number of unique visitors per month to understand how much of our total addressable market we’re reaching. This simple exercise (despite how rough my estimates are and how imperfect Google Analytics is) demonstrates that we’ve barely tapped our potential to reach our addressable market. The last step is by far the most actionable, which I like, because sometimes doing too much of this theoretical study feels unproductive. We’ve defined our audience, figured out roughly how many of them we’re reaching and now, obviously, need to figure out how to reach more of them. So I created a spreadsheet that details all the ways we can “distribute” and every single possible place we can distribute to. I created one of these for each of our bureau locations as well as nationwide (here’s a larger view). Everyone defines distribution differently, so I decided to specifically define what I think distribution could mean for us now: linking to our stories in a post, linking to our stories in a news roundup/newsletter, using social media to promote our posts, republishing our content and interviewing our reporters. I also didn’t want to limit our distribution to just media outlets, because it’s not the only place people get their information. If a teachers union links to our stories in an email newsletter, it’s just as valuable as that same story being republished in a popular city newspaper. It’s all about going to where readers are — not assuming that they will come to you. One last, important note: Audience research shouldn’t be done on a one-time basis. It should be an ongoing process to assess changes in who our audience is, their interests and how they’re getting their information. And as our audience changes, our content and engagement efforts should change too. 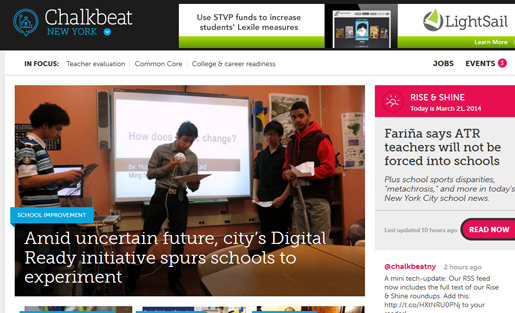 Anika Anand is the director of engagement for Chalkbeat and was previously a reporter for GothamSchools. She has been published on California Watch, MSNBC.com, Salon, the New York Daily News and others. She graduated from the CUNY Graduate School of Journalism with a master’s degree in business and economics reporting and studied journalism at the University of North Carolina at Chapel Hill. This story has been cross-posted at NewsBiz and Anika Anand’s personal blog. I think you are underestimating your Indianapolis audience. Those numbers are for IPS, granted the largest district in the city, and the focus of most ChalkbeatIN articles. But, IPS is one of nine large districts in the county, and many of Scott Elliott’s articles have statewide interest and implications. Indiana certainly is ripe with education news. INTeacher, yes we only looked at the numbers for IPS because that’s the district we primarily cover in Indiana right now. As Scott grows his reporting team, he’ll have to decide exactly which school districts to cover and then we’ll take those numbers into account.